One of the truly great memories of this magical journey to Innherred was the time-correct performances on each place we arrived at, with so many people dressed as they were dressed back then. That, and the enthusiasm of everyone that played a part in making this a memorable experience, was truly of another dimension. From the live accordion music on deck, to the Captain dancing with the ship’s guests, to the local delicious dishes we were served in each port we arrived at, and to the incredible comeraderie amongst the entire crew - it all came together as one absolutely magical experience. Another great part of this journey was for me the dream-come true experience of the open-air navigation of the vessel. On “Hansteen", all the navigation are done OUTDOORS. As we departed from Leksvik bound for Trondheim on Sunday night, we encountered a strong westerly breeze and 1-1,5 meter swell. 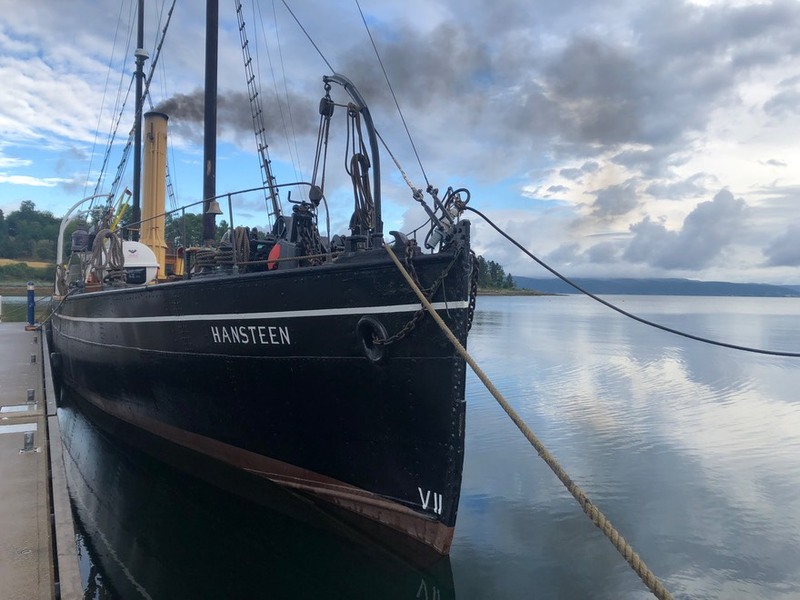 It was so incredibly invigorating standing on the stern of the “Hansteen” as her commanding Captain, in sea-spray and heavy seas, doing the navigation like my predecessors did more than a hundred years ago. I was so alive and so … ehhh… turned on!